Valentine's Day can seem super commercialized and cliche. But it can also be a really lovely chance to show the people you care about some love, without breaking the bank! To me, Valentine's Day doesn't need to just be for lovers. I have heard of single girls who celebrate "Galentine's Day" with dinner and wine, for them it celebrates friendship. Hubby and I used to go out for dinner or he would buy me flowers, but now with our thrifty lifestyle we celebrate at home with our kids and try and do a little something special for them too. With a bit of planning and thought, you can come up with something handmade and meaningful without breaking the bank! Here are some frugal Valentine's Day ideas that we have done or made in previous years. 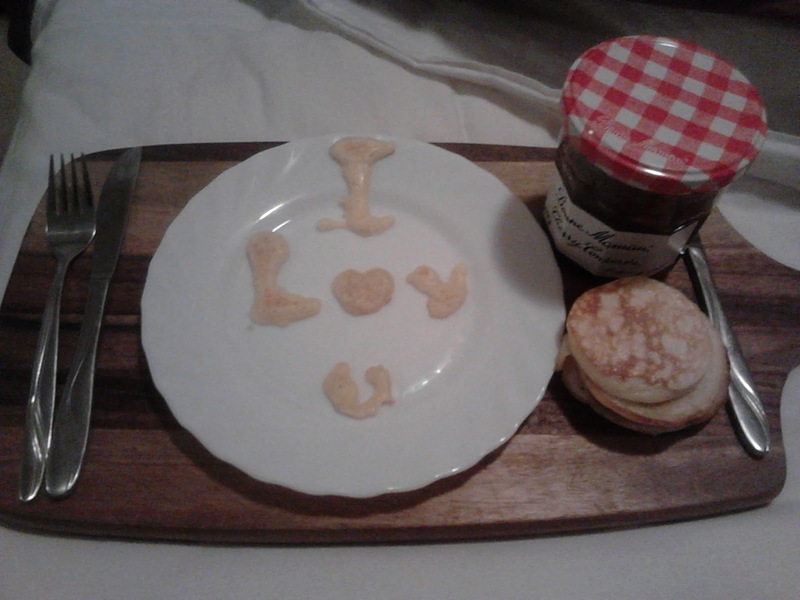 This was something my eldest son did for me when he was about 11, and learning to cook. 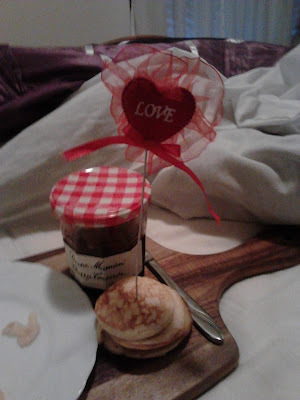 He made some simple pikelets served with jam and a heart pick from our craft box. If you have a metal biscuit cutter you could pour the batter into that and make heart shaped ones. Other breakfast ideas are pancakes, french toast, scrambled eggs or even just a couple slices of toast and tea would be nice too. For my international readers, pikelets are like a small sized pancake made with self raising flour so they are thick and fluffy. We like to have them for breakfast or a snack and serve them with jam or lemon butter. Delicious! Homemade pikelets served with jam. 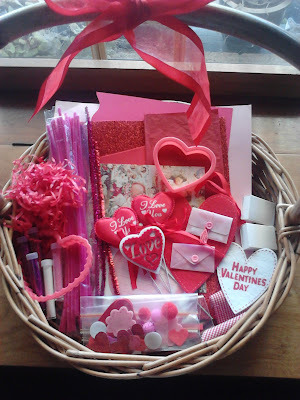 A few years ago I set up an invitation to craft Valentine's basket. I looked through all my craft supplies and filled the basket with red, pink and white card stock, glitter paper, pipe cleaners, red, pink and white felt hearts, heart shaped biscuit cutters, ribbons, white match boxes, tissue paper, mini pink envelopes and some "I Love You" Valentine's hearts on a stick. These were all items I already had, and I layered them in a wicker basket and tied a red ribbon to the top. 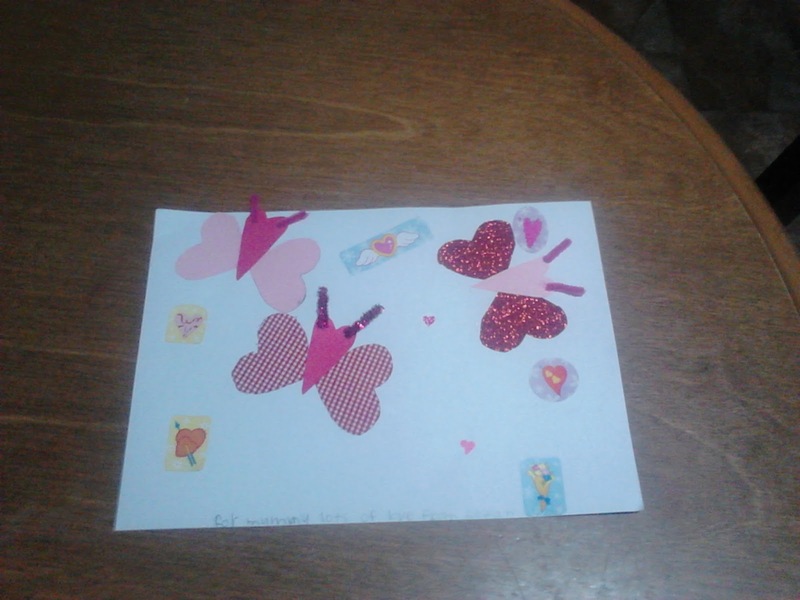 The kids all had fun making cards and collages. 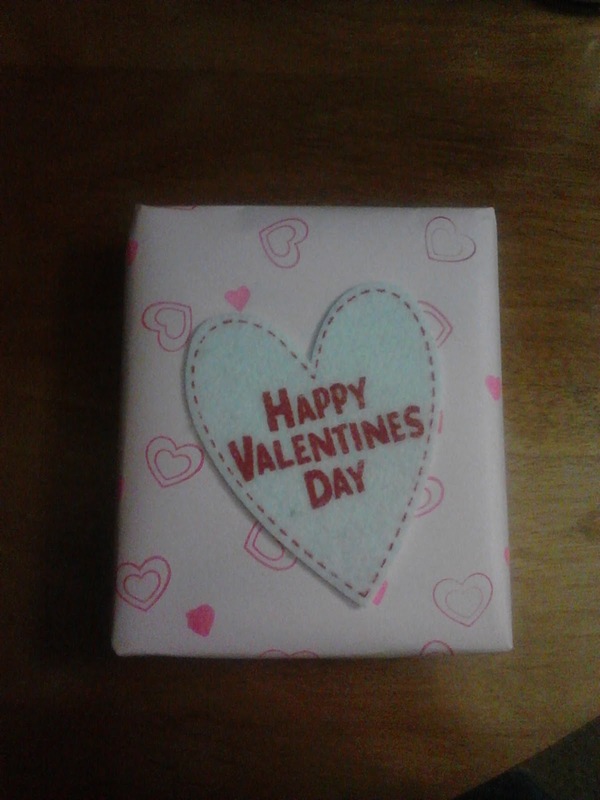 One of the creations made with craft items from the Valentine basket. 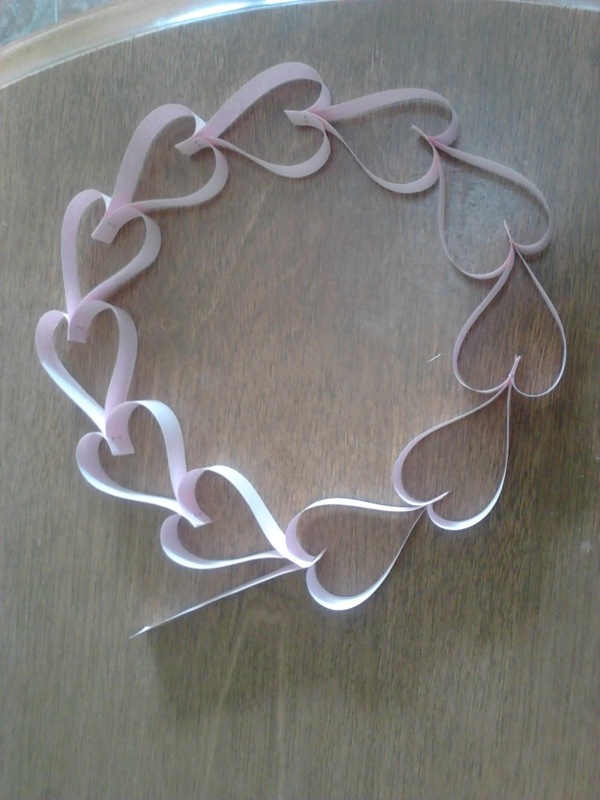 I made a cute paper heart garland to decorate our house that I found the instructions for here at the time I only had pink paper, but it still looks great! They can be hung from the ceiling, or made into a wreath. Another idea is to cut hearts out of paper and write love notes on them and stick them around the house. Hubby did this for me on one of our first Valentine's Days together. Instead of hanging the hearts you could make a wreath. 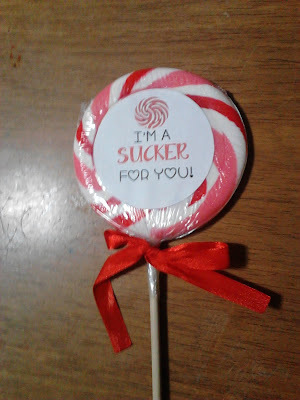 I bought a few of the large $1 lollipops which are sold at Kmart and found some free printable labels, glued them on and added a bow. So adorable! Unfortunately I can no longer find the link to these, I can only see paid versions but you could draw your own up on paper or use a word document to type some up. I loved these lollipops, maybe more than the kids. A simple picture or message on cardstock makes a cute Valentine. I particularly love these vintage ones. Which look great cut out and glued on some card. I have also glued these onto a flattened paper muffin cases as pictured below. 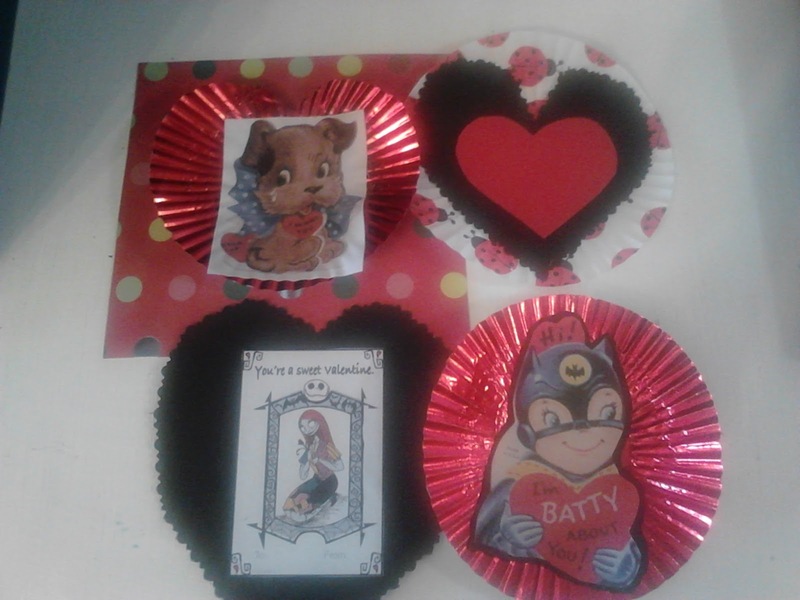 Homemade Valentine's we made from with free printables, cardstock and muffin cases. and because we love Nightmare Before Christmas I found some on The Binder Ladies website. They also have a list of Disney and other character ones. One of my favourite Valentine's Day's was when my hubby, who is not known for his culinary skills I might add- baked me some shortbread hearts and dipped half of each one in chocolate. 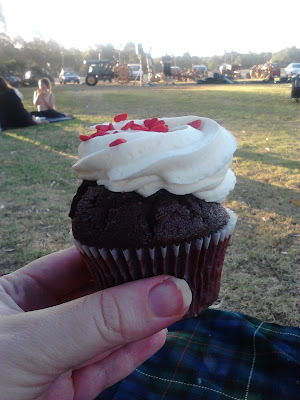 Homemade cupcakes are also a cheap and nice idea. I have made vanilla cupcakes in the past, decorated with buttercream, red sugar and some free printable flags I found online. I just glued each one onto a toothpick. 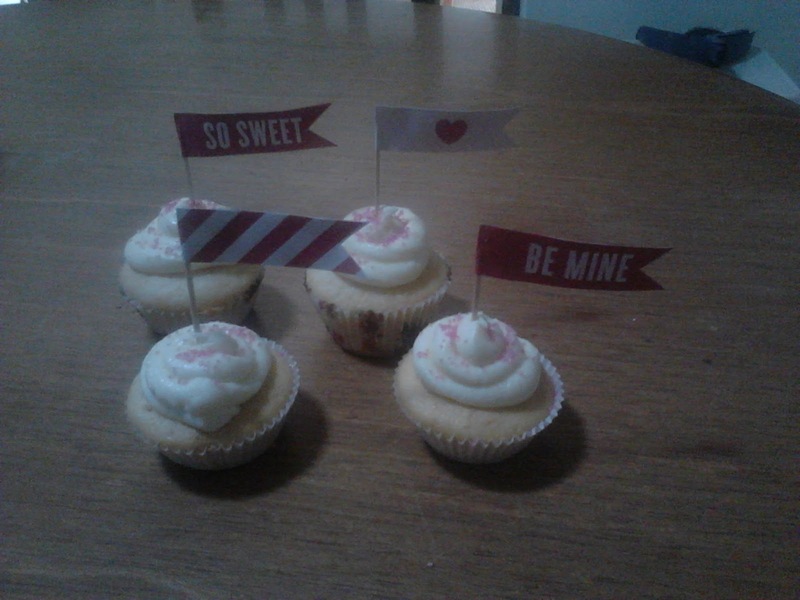 If you do a Google search for "free Valentine's cupcake toppers" there are many to choose from. 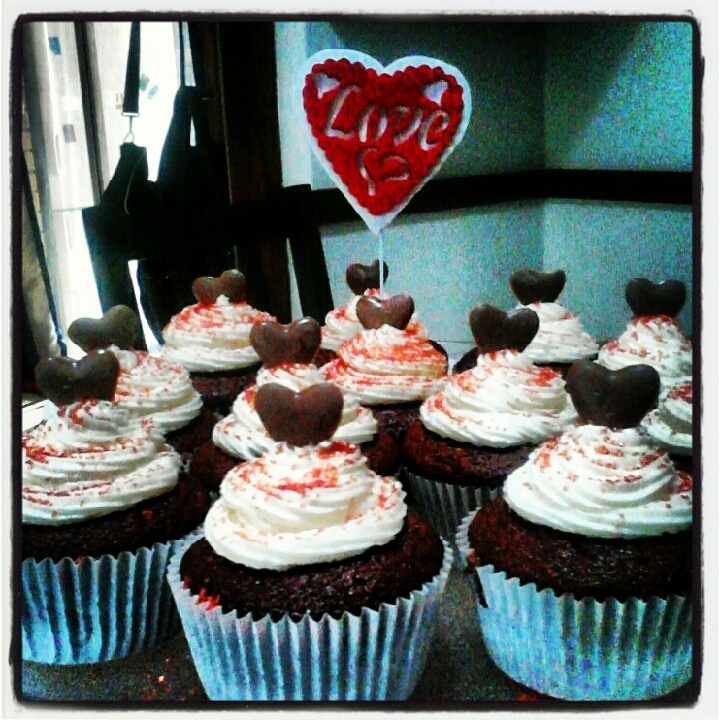 I have also made chocolate cupcakes, again with buttercream red sugar and chocolate hearts I got on clearance one year. Valentine's cupcakes I made. Every picture looks better with an IG filter I think! 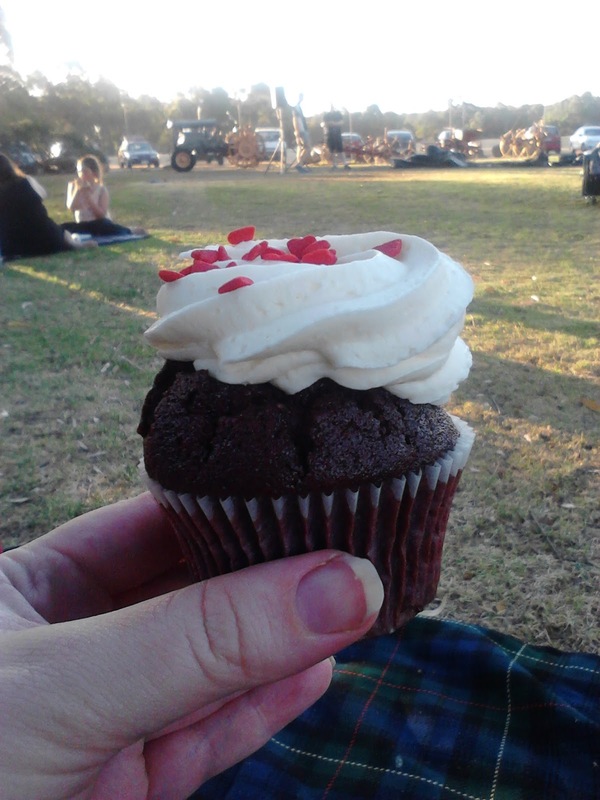 Homemade cupcakes with buttercream and red sugar. 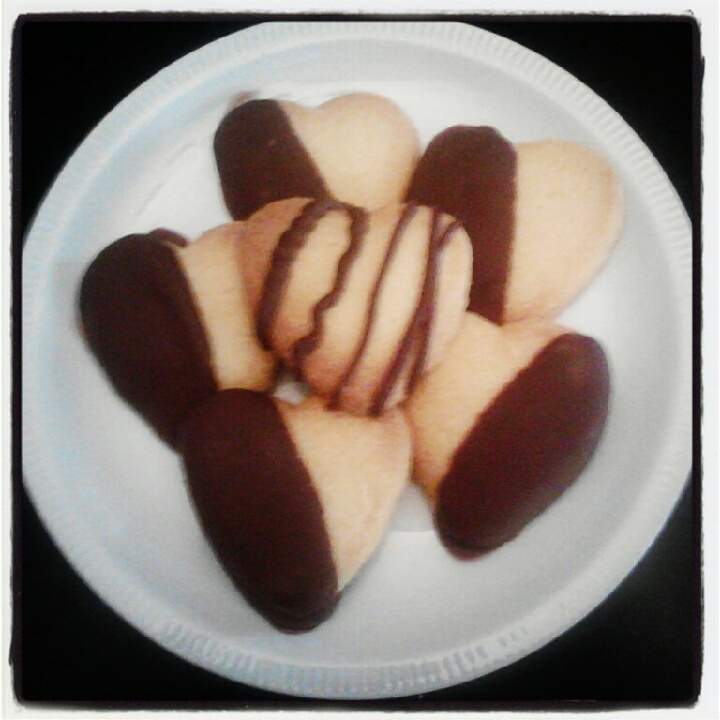 Shortbread biscuits made by my hubby. In the past I have bought hubby a $2 box of strawberry truffles which are his favourite and wrapped them in white paper and decorated the paper with stamps and a felt heart. Last year after Christmas I scored a heart shaped box of chocolates, reduced to $1.50 soI bought them and stashed the box away for Valentines Day! If you have moulds, you could make your own chocolates. We are having a heatwave here at the moment, so I won't be doing that this year. 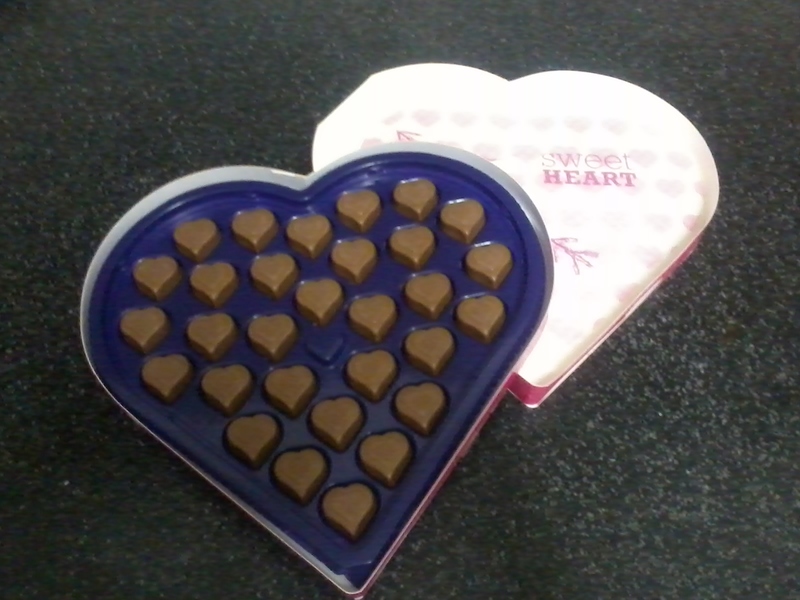 A cheap box of chocolates, fancied up with white paper, stamps and a felt heart. The $1.50 box I bought after Christmas. 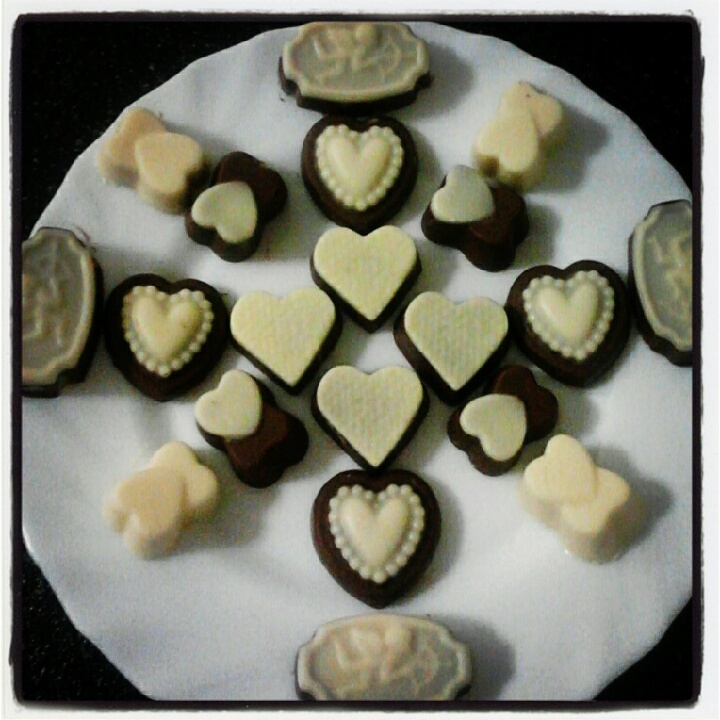 Our homemade chocolates with white and milk choc. website to see if there is anything cheap or free on near you. If you don't feel like going out, or your budget doesn't allow, you could always make a romantic meal at home. Set the table with a nice tablecloth, some candles and cook something yummy. Maybe add a homemade cake or treat for dessert and voila instant romantic dinner! What about a movie night at home? 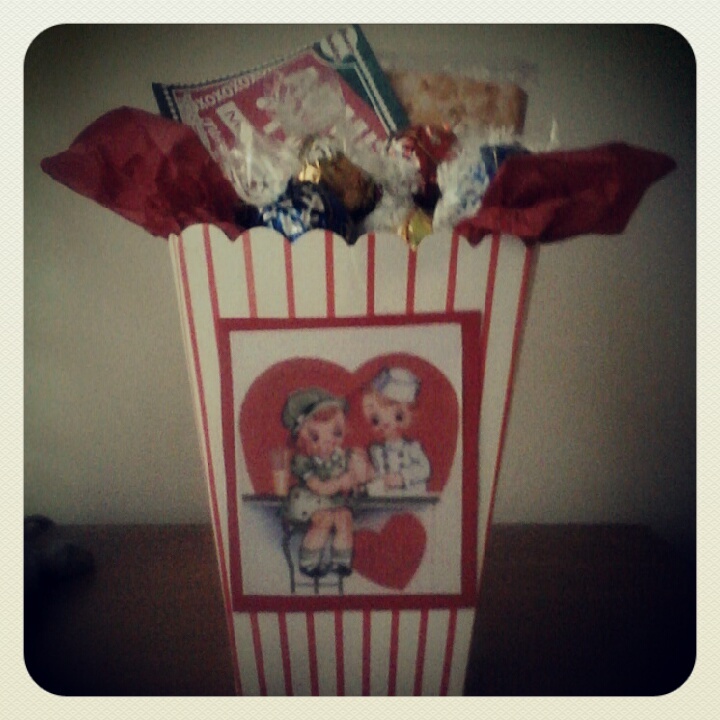 One year I made hubby a romantic movie box. Which was just a cardboard popcorn tub which I printed out one of the vintage Valentine's to go on the front. I filled it with things we already had. Red tissue paper, microwave popcorn pack. Lindt chocolates and a "movie of your choice" voucher. I already had a few books of vouchers which I bought from a cheap variety store, and we just keep reusing them. But I found a website with free love coupons which might be useful. This year I plan on making some heart shaped biscuits, I will make a few of the paper heart garlands now I have red paper in my craft stash, and am sewing up a little garland of felt hearts for our mantle too. I will make a chocolate cake for dessert and might see if I can borrow a movie from the library. I love all your ideas. I adore the craft basket idea. LOVE!!!! I think a free outdoor movie we would be so fun!!! We always do a dinner with candles, table décor, and I make a individual Strawberry Heart Shaped Cakes for the whole family. Mel, lots of ideas there. Thanks for commenting on my blog today but Blogger sent it into cyberspace when I clicked 'Publish'. So sorry. Glad you liked the grandparenting ideas.